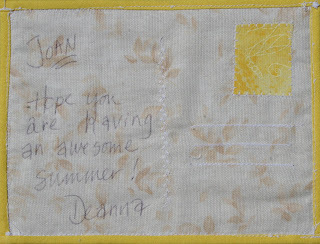 In my online round robin quilting bee group, a few of us decided to swap quilted postcards. Something like artists’ trading cards, only postcard size. 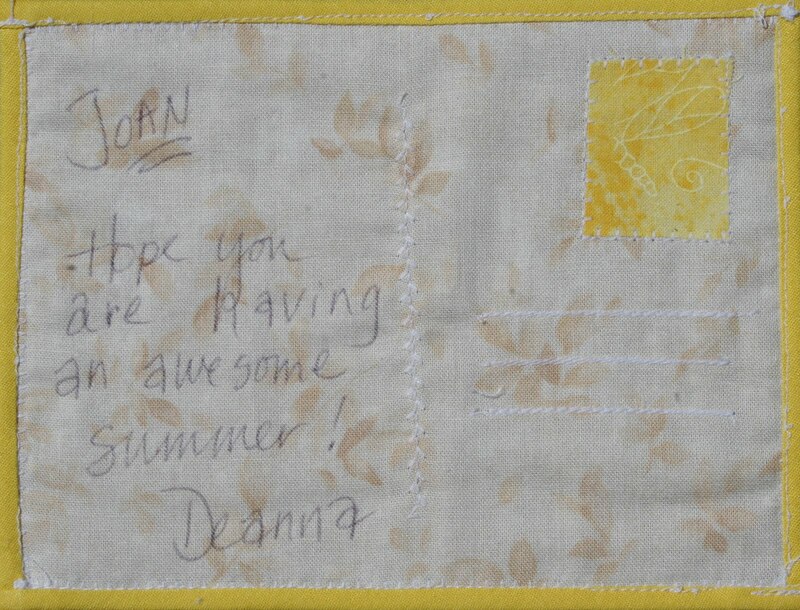 I have only done one of these before, but I had fun sewing mine and sending it to Terrie in Sourthern California. This is the darling card I received from Deanna in Ohio. The mountains remind of the Grand Tetons outside of Yellowstone National Park and summer vacation! The back is darling, too! Love the yellow butterfly stamp. Thanks so much, Deanna. The card is proudly displayed on my inspiration board on the wall in my sewing room. Block nine was another quick, easy pattern. I enjoy using this line of fabric (Objects of Desire – Moda). All of the blocks have a bright and cheery look. 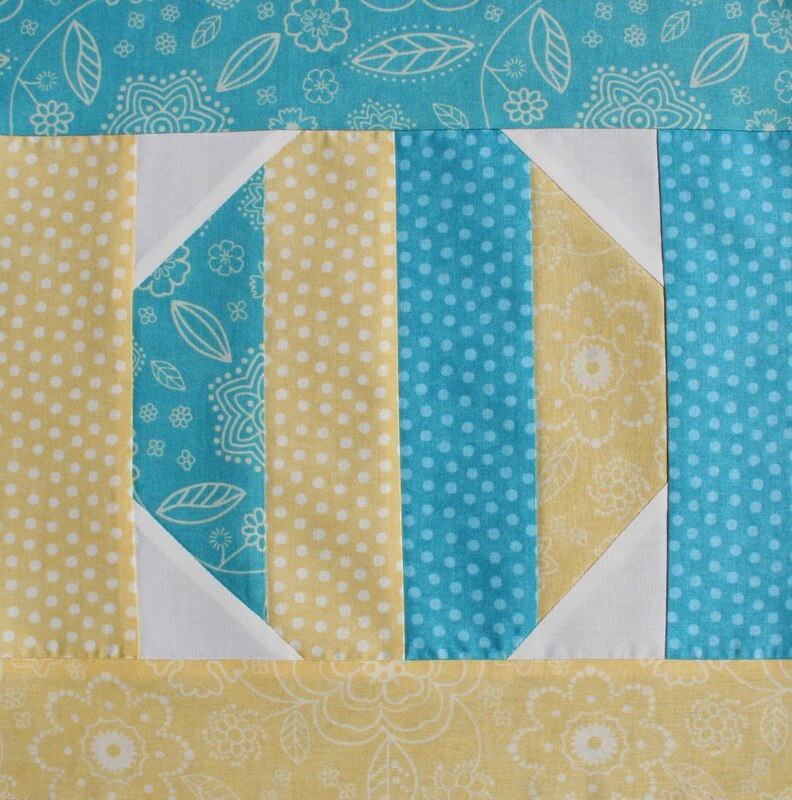 It is a good thing that we only have three blocks to go in this quilt along because my jelly roll is almost gone! In the Traveling Bee quilt group I am participating in, we are having a quilt-along. 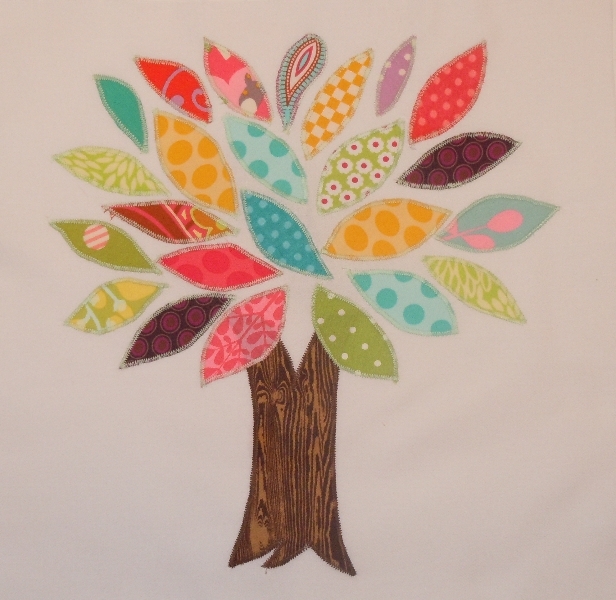 Each month one of the participants chooses a block and everyone sews it up. This month Vickie chose Dutchman’s Puzzle. The flying geese block is an old standard, but Vickie posted a tutorial at www.sisterschoice.typepad.com/sisters_choice_quilts/2007/04/f that shows how to make four blocks at once. Wow! 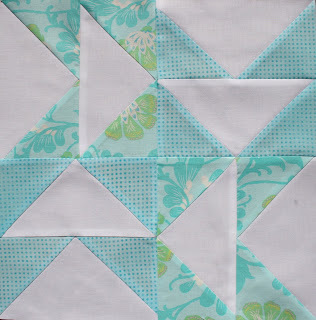 I have always cut the rectangle, put the squares in the corners, sewn edge to edge, cut off the ears, pressed and repeat. The method shown in the tutorial is speedy and insures perfect points every time. 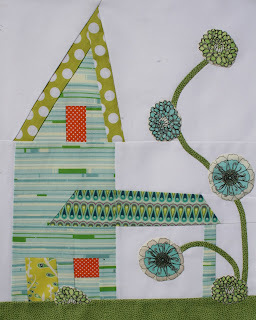 In my Secret Society of the Traveling Bee group, Cindy N. asked for a neighborhood of wonky houses. I learned something in sewing this block. I am a symmetry girl. 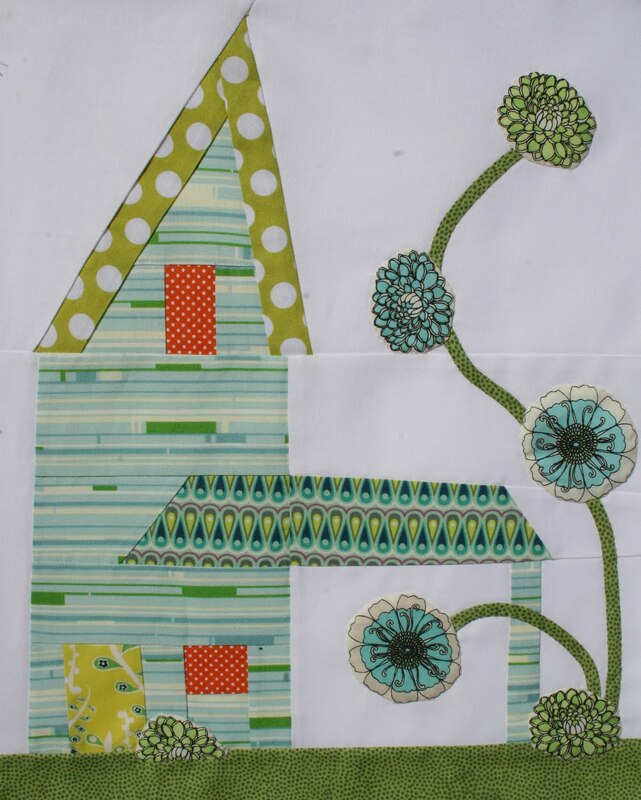 It is actually harder than it looks to sew these cute little houses that are….well…wonky. It was fun doing this block because it is so different from what I usually do. I hope Cindy likes it. Here is the rest of the neighborhood so far. Take a trip over to my friend Jane’s giveaway! The button for Jane’s Fabrics is at the top of my page. 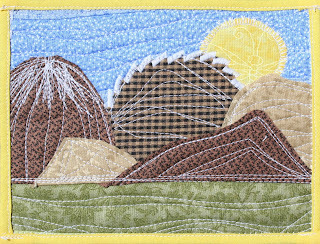 Last fall Electric Quilt organized a design challenge in conjunction with AccuCut, Martingale Publishing and Nine Patch Media. 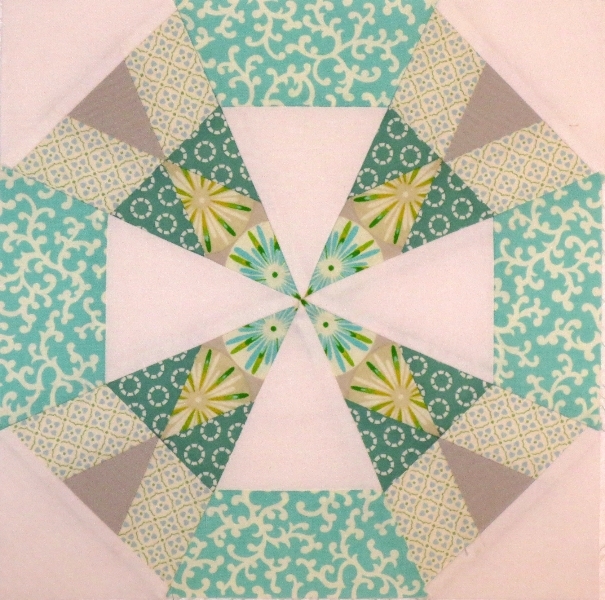 The challenge was to design a Rose of Sharon block in the EQ software using the AccuCut shapes: a simple rose shape in 8 sizes, a simple leaf shape in 8 sizes and a small palette of batik fabrics. I submitted a dozen designs, all non-traditional. It was fun coming up with the designs but I hit “send” and forgot about it. At Spring Market they displayed the six winning designs made up into a beautiful quilt. The grand prize was an embroidery software package, but since I don’t have an embroidery machine I wasn’t having prize envy. I have received an email from Sharon Pederson, who is writing a book for Martingale and doing a DVD for Nine Patch Media about this challenge. 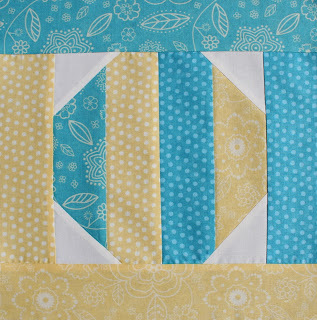 One or more of my blocks are being included in her book and the DVD. She only had room for 84 blocks in the book. There were 850 entries. I am speechless! I will be interested to see the book when it is released in August. At this point I can only guess which block made it in, but I hope it was “Sharon’s in Love.” It was my favorite.